I'm hosting a Polaroid block swap with a focus on kawaii Japanese fabrics! Keep reading for details and sign ups! 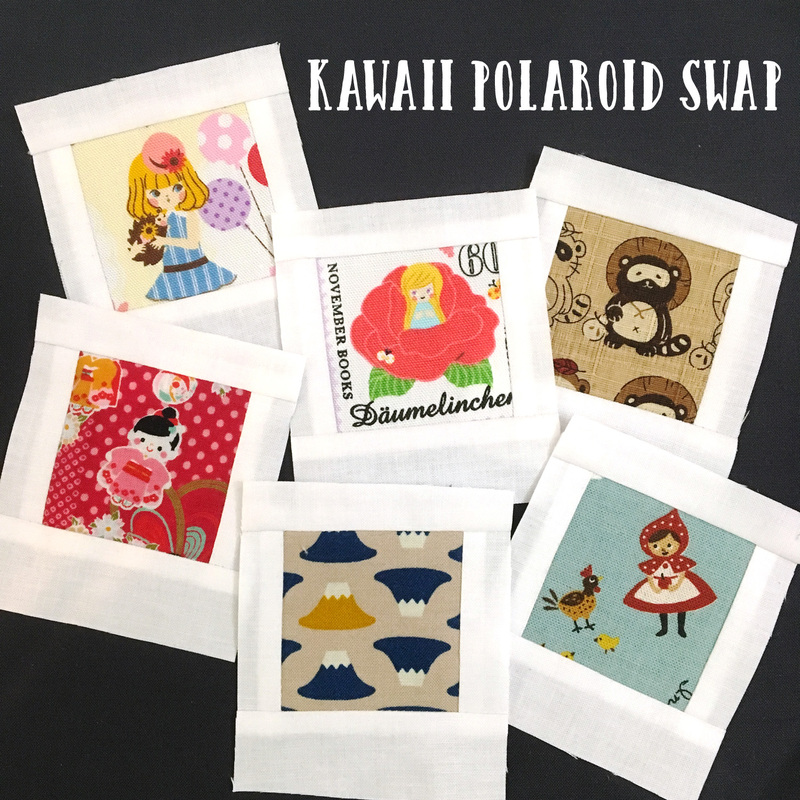 Check out the hashtag #KawaiiPolaroidSwap to see what people are making. 1. Make your Polaroids according to the instructions from Occasional Piece but do not trim your finished polaroid as stated in step 5. We will be mailing our Polaroids untrimmed. 2. 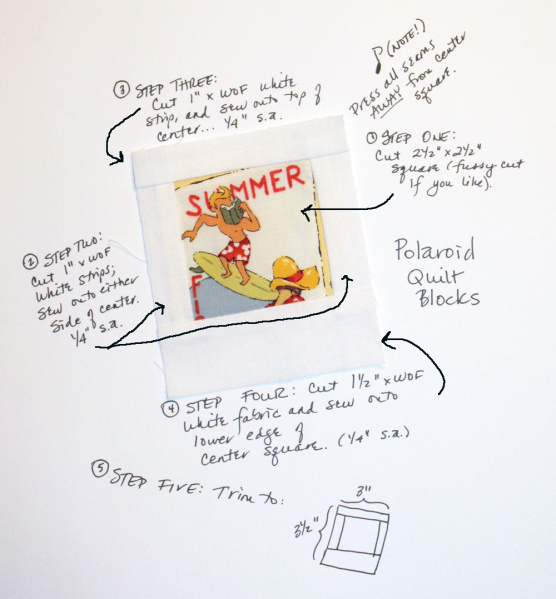 Use quilt shop quality white (not off white, cream, or beige) solid fabric for your Polaroids. Kona White is the preferred brand/color, but other quilt shop brands like Michael Miller, Art Gallery, and Moda are fine. 3. "Photo" fabric must be kawaii. We're looking for cuteness, not traditional kimono prints or boring florals. Look for themes of fairy tale characters, cute food, animals, ordinary items with faces, and lovable characters. 4. "Photo" fabric must be of Japanese origin. We want Polaroids featuring fabrics that are less commonly found in the US, so no Cotton + Steel, Lizzy House, Heather Ross, etc. Even if the print fits the kawaii aesthetic, it still needs to be Japanese. Western designers who designed for Japanese companies (like Heather Ross for Kokka) should not be used either. Good shops for kawaii fabric include Bunny's Designs, Pink Castle Fabrics, Super Buzzy, and various etsy sellers. 5. Send no more than 3 blocks from the same fabric. We want variety so that everyone gets something new. 6. Blocks that do not follow these rules will be returned to their owner. You will ship your finished Polaroids to me in increments of 5 with a maximum of 20 Polaroids. I will sort through all the Polaroids and send you new ones made by other participants. You will receive the the same amount that you sent, so send 10, receive 10, etc. This swap is open to US residents only. Include an unsealed self-addressed envelope, including postage with your Polaroids. I will use this to send new Polaroids back to you. Shipping deadline is September 30th. To sign up, fill out the sign up form by clicking this link. Once you submit, the form will show you my mailing address.